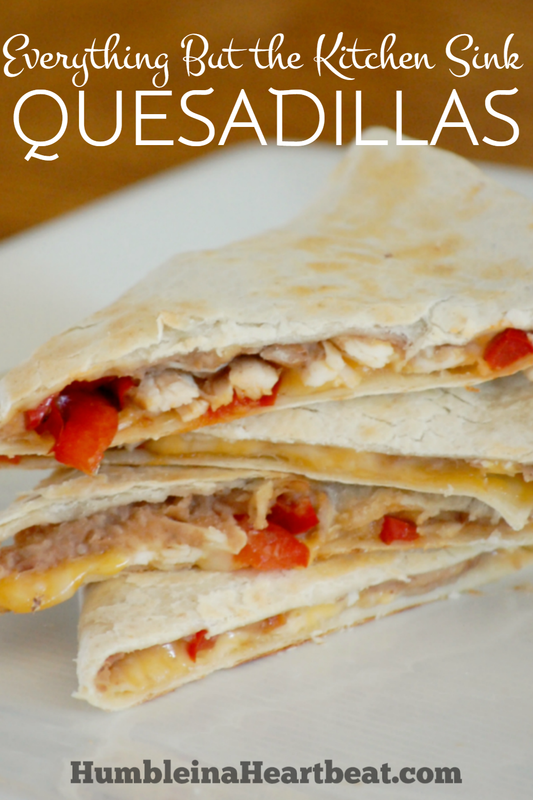 Quesadillas are traditionally just melted cheese on a tortilla. But you can pretty much add anything under the sun to make it to your taste. We do that for lunch and dinner a lot around here. That’s why I like to call our quesadillas Everything But the Kitchen Sink Quesadillas. I usually just grab whatever I can find in our fridge and throw it on the tortilla. We like sauteed peppers and onions, refried beans, tomatoes, avocados, and more. Of course, these quesadillas wouldn’t be complete without a little sour cream and salsa. 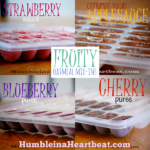 I figure if you’re trying to save some money on groceries, you can either use up food in your fridge that will be going bad soon or you can keep the toppings to a minimum if you don’t have much in your fridge. All you really need to make them is tortillas and cheese. You could even leave off the cheese if you’re vegan. 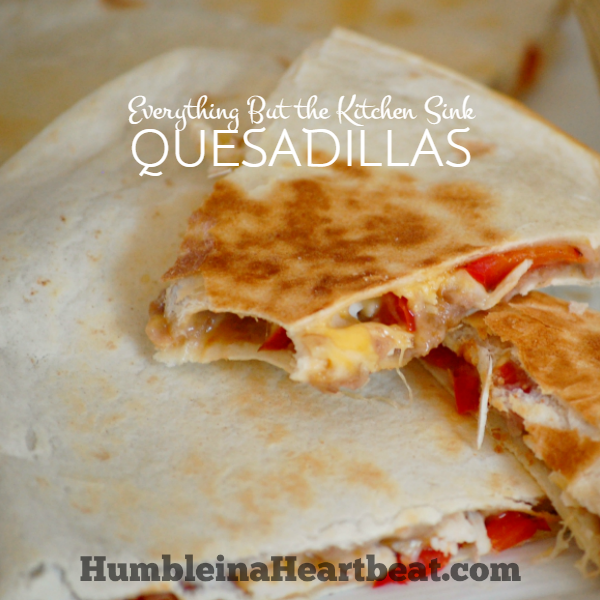 I guess, then, they wouldn’t be called quesadillas if you did that, but who’s keeping track? Call them Vegadillas if you want. Ha! 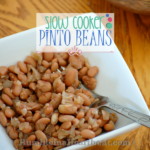 I usually like to make these after we have had some Slow Cooker Pinto Beans for dinner. 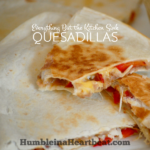 I’ll make these quesadillas the next day to use some mashed up beans. Other times, I take a bag of refried beans out of the freezer. 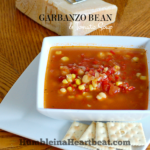 I like to keep beans on hand in the freezer at all times since they are so versatile and delish. 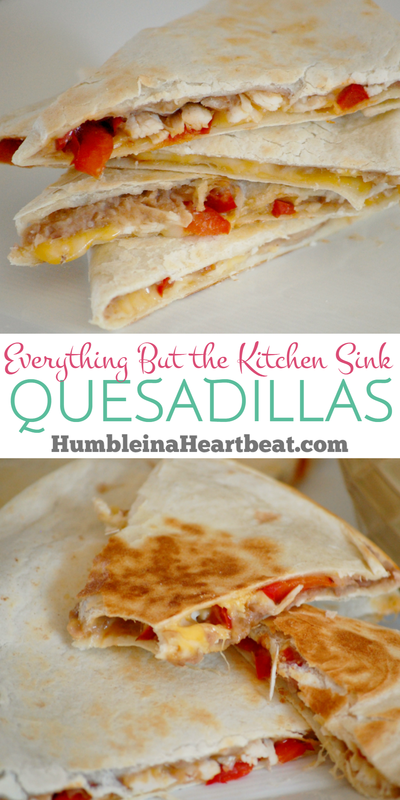 Everything But the Kitchen Sink Quesadillas would also be great to eat the day after you have tacos or burritos. 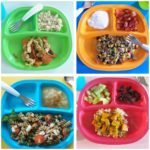 There will probably be leftover veggies, cheese, and tortillas, so you can make a quick lunch with everything you have on hand. Super simple. Super yum. 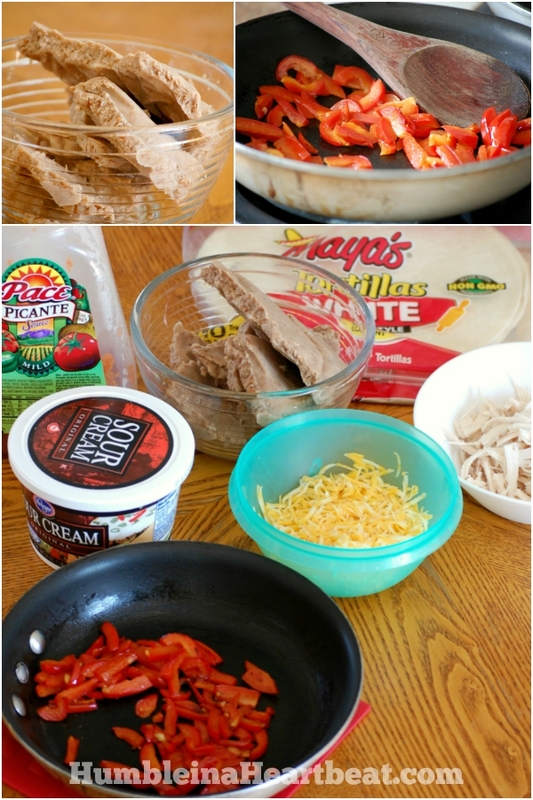 Gather all your toppings and make sure they are all ready to add to your tortillas (i.e. red bell peppers and onions can be sauteed so they are soft or you can add them raw, cheese should be shredded, chicken should be cooked and shredded, etc.). Now, start assembling. Put out a tortilla and to one half add some refried beans, cheese, veggies, and more cheese if you’d like. Fold the tortilla in half. Continue to do this to all your tortillas. Put a skillet on a burner over medium heat and let it get hot. Add one or two assembled quesadillas at a time (depending on the size of your skillet) and let it get golden brown before flipping (usually about 3-4 minutes). 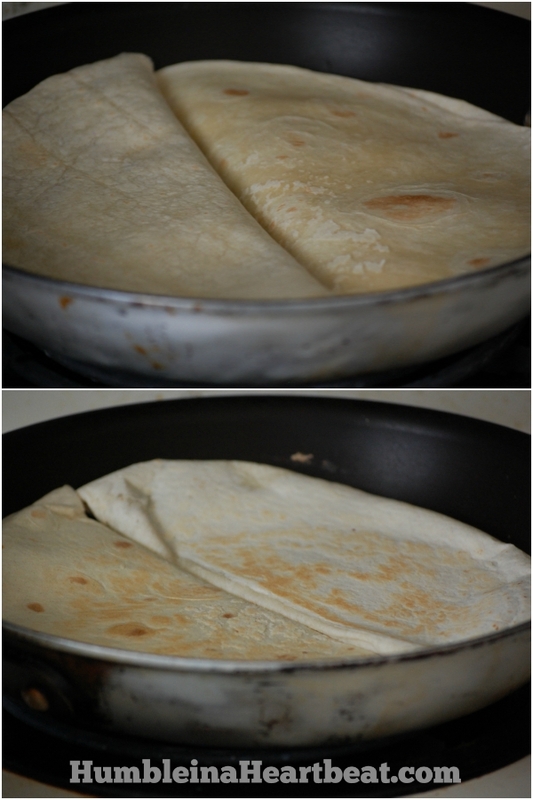 Carefully flip the quesadillas over and let the other side get golden brown as well. Take out of the skillet and let cool for 4 minutes. With a large knife or a pizza cutter, slice each tortilla in half or quarters and enjoy with your optional sides. Whether you eat the most basic quesadilla or have every topping and side available, you are spending way less than you would pay if you were to eat out. What a bargain! What toppings would you put on your quesadilla? 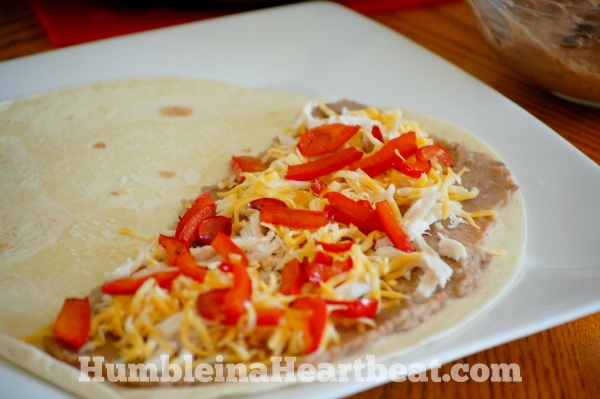 Gather all your toppings and make sure they are ready to add to your tortillas (i.e. red bell peppers and onions can be sauteed so they are soft or you can add them raw, cheese should be shredded, chicken should be cooked and shredded, etc.). Put out a tortilla and to one half add some refried beans, cheese, veggies, and more cheese if you’d like. Fold the tortilla in half. Assemble all your tortillas in the same manner. Take the tortillas out of the skillet and let cool for 4 minutes. With a large knife or a pizza cutter, slice each tortilla in half or quarters and enjoy with your optional sides. Oh yum! My kids would love these. You think along the same lines as I do. We make a lot of “everything but the kitchen sink” dishes: salads, stir fries, and soups. Going to have to add some tortillas to the shopping list! Ooh, you’ve given me a lot of great ideas. 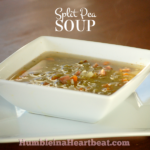 I always follow a recipe when it comes to soup, but I think I’ve made them enough times that I could start throwing in whatever my heart desires! Yummmm Charlee! I love quesadillas. 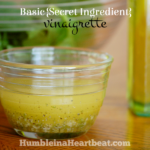 These have some of my favorite ingredients too.